The National Communications Authority (NCA) has observed the 2019 World Consumer Rights Day (WCRD) in four regions with road shows under the theme “Consumer Empowerment and Protection in a Smarter Market”. The four Regions that the celebrations were held include the Central, Eastern, Northern and Volta Regions. Each year, the NCA creates awareness about a specific consumer right theme within the telecommunications industry. This year’s theme provided a platform for the Authority to sensitise consumers on their rights and educate them on other consumer-related issues such as the Consumer Complaint Process, Mobile Number Portability, Mobile Money Fraud Prevention and Unsolicited Electronic Communications among others. This, according to the Director, Consumer and Corporate Affairs of the NCA, Mrs. Nana Defie Badu, would empower consumers to know their rights and responsibilities and also equip them with the right information to enable them make better and informed decisions on their telecom products and services. She said “the NCA does not relent when it comes to consumer protection. Consumers should know their rights and responsibilities and consumer-related initiatives that the Authority has put in place to boost consumer confidence in the industry. She also made a call on Service Providers to comply with consumer protection rules and policies and ensure transparency as well as fair treatment for all consumers. At Koforidua, the event brought together diverse consumers with different needs to the Juaben Serwaa Market for the celebration. Funny Face, a Comedian, moderated the show. 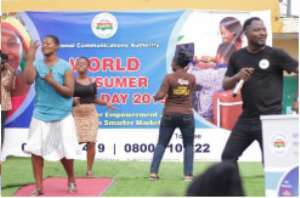 He entertained the crowd and engaged them in various fun activities like Dancing Competition to drive content delivered home. Staffs of the Authority were on standby to address complaints presented. The celebration at Ho begun with a float led by a brass band amidst comedians like Efo Gasor, a Kumawood actor and Chilling Mama a well-known comedian who aided to pull a crowd at the venue- Ho Market Top, where the educational session took place. Cape Coast was not left out of this year’s celebration. With the presence of Candyman and Okoto Perry, a radio presenter and a musician respectively, consumers of the industry converged at the Kotokuruba market for their own share of the education. At the Lamashegu Market in Tamale, speakers addressed issues that affect consumers of telecommunication services. The event which was attended by all categories of consumers of telecommunications services was graced by the Presiding Member of the Tamale Metropolitan Assembly, some Assembly Members and representatives from the Lamashegu Chieftancy. A Cultural Troupe from the Centre for National Culture in Tamale and a popular Comedian/Musician, Fante Dokono were there to keep the crowd alive. On the whole, the shows were very educative and successful. Traders and commuters who visited the NCA stand at the various locations were educated by the staff of the Authority, after which those who were able to answer questions on the topics discussed were presented with NCA branded souvenirs which had the Authority’s contact details printed on them. This, the Authority hopes will be a quick reminder to consumers to call on the Authority when their complaints are not resolved by their operators satisfactorily.  Scenes from Lamashegu Market, Tamale About World Consumer Rights Day (WCRD) 15th March is World Consumer Rights Day (WCRD), an annual occasion for celebration and solidarity within the international consumer movement. It marks the date in 1962 President John F Kennedy first outlined the definition of Consumer Rights. WCRD is an opportunity to promote the basic rights of all consumers, for demanding that those rights are respected and protected, and for protesting the market abuses and social injustices which undermine them. WCRD was first observed on 15th March 1983 and has since become an important occasion for mobilising citizen action. The National Communications Authority, (NCA), was established by an Act of Parliament, Act 524 in December 1996, which has been repealed and replaced by the National Communications Authority Act, 2008 (Act 769). The Authority is the statutory body mandated to license and to regulate electronic communication activities and services in the country.